What is it about lightning bolts that make them so goddamn scary? Oh yeah, that crazy electrocution thing. Now imagine being in a plane—in the freaking air—and getting struck by lightning. That's what happened here. 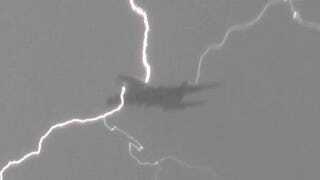 An Airbus A380 was flying into London's Heathrow Airport and as the plane touched down, was struck by a lightning bolt from the stormy night's sky. The plane landed safely but my god, the horror, the horror.